Members of the cabbage family, dating as early as the 13th century, Brussels sprouts grow on long, curving stalks that resemble tiny cabbages. 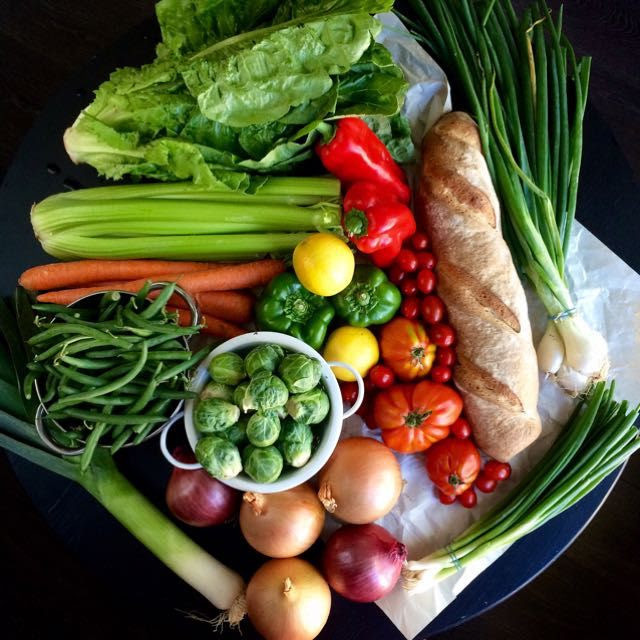 They were first seen in Belgium, but lucky for us, they’ve made their way to farmer’s markets in the US. 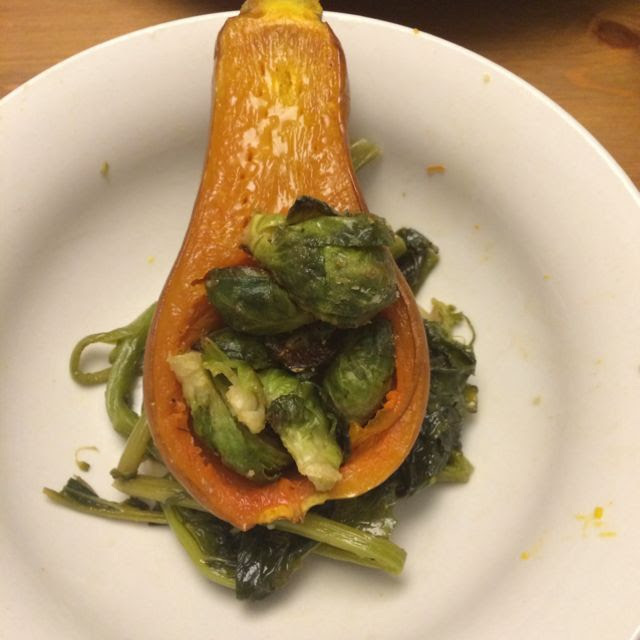 If you haven’t seen these sprouts on the stem, head over to your local market because they’re in season. How to Buy: Look for sprouts that are heavy for their size and bright green, with leaves clinging tightly to the heads. Avoid any with yellowing leaves, which indicate aging. Check that the stem ends are freshly cut. Small heads, about 1 inch in diameter, are usually preferable to large ones, unless the large heads are dark green and firm. How to Store: Store in plastic bags or the original packaging in the refrigerator for up to 4 days, but try to eat as soon as possible after purchase. To freeze, blanch for 4 to 5 minutes, depending on size. Then refresh in cold water, drain and freeze in sturdy freezer bags. Method: Preheat your oven to 400 degrees F. Heat 2 tbsp of oil over medium heat in a cast iron pan, then add in the sprouts, cut side down. When the cut side of the sprouts begin to brown, about 5-8 minutes, place the pan in the oven to finish cooking for 15 minutes or so. While the sprouts roast, make your sauce. Simply pulse together the fish sauce, water, vinegar, lime juice, sugar, garlic, and chiles/peppers in a food processor. Taste and adjust seasonings as necessary. If it’s too salty, add more water or lime juice. 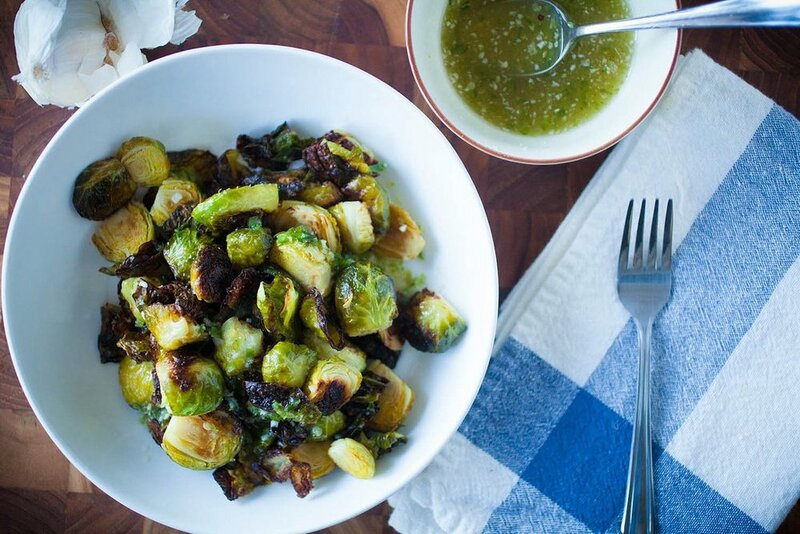 Once the Brussels sprouts are ready, remove them from the oven and toss with about half of the vinaigrette. Taste, and add more vinaigrette until the flavor is where you want. Method: Heat a grill to medium heat. Cut off the stem end of the Brussels sprouts and remove any yellowing outer leaves. Place the sprouts into a large, microwave safe mixing bowl and heat in the microwave on high for 3 minutes. Add the olive oil, garlic, mustard, paprika and salt and toss to combine. Allow the sprouts to cool until you can handle them. 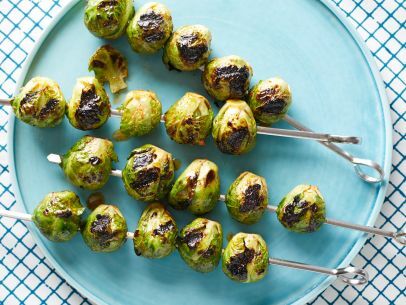 Skewer 4 to 5 Brussels sprouts onto each metal skewer with the stem ends facing in the same direction, leaving 1/2-inch in between each sprout. Place the skewers onto the grill with stem end closest to the flame. Cover and cook for 5 minutes. Turn the skewers over and cook for another 5 minutes. Serve as is.